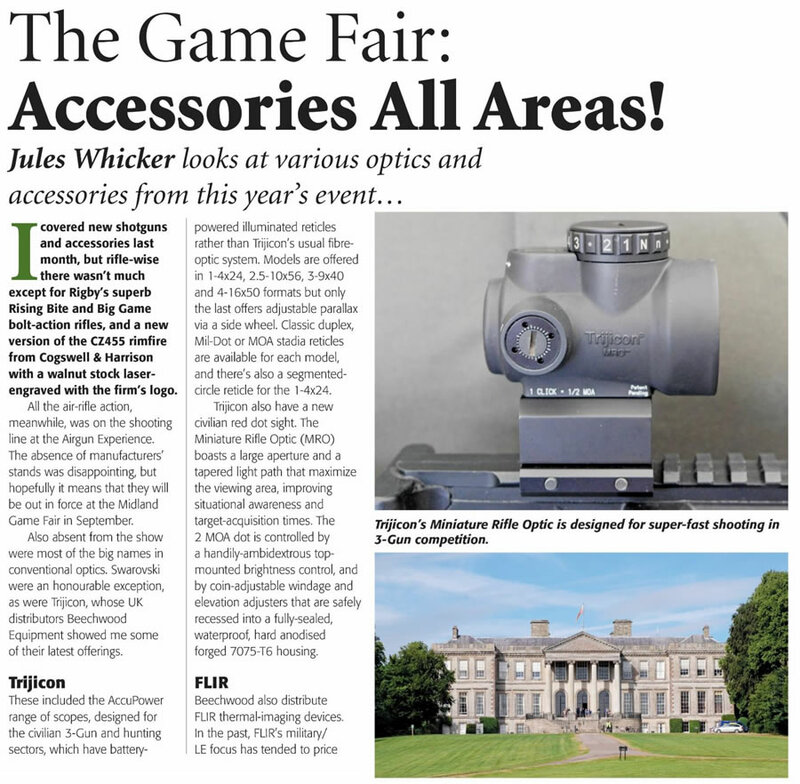 The Game Fair: Accessories All Areas! I covered new shotguns and accessories last month, but rifle-wise there wasn't much except for Rigby's superb Rising Bite and Big Game bolt-action rifles, and a new version of the CZ455 rimfire from Cogswell & Harrison with a walnut stock laser­engraved with the firm's logo. All the air-rifle action, meanwhile, was on the shooting line at the Airgun Experience. The absence of manufacturers' stands was disappointing, but hopefully it means that they will be out in force at the Midland Game Fair in September. Also absent from the show were most of the big names in conventionaI optics. Swarovski were an honourable exception, as were Trijicon, whose UK distributors Beechwood Equipment showed me some of their latest offerings. These included the AccuPower range of scopes, designed for the civilian 3-Gun and hunting sectors, which have battery-powered illuminated reticles rather than Trijicon's usual fibre­optic system. Models a re offered in 1-4x24, 2.5-1 0x56, 3-9x40 and 4-16x50 formats but only the last offers adjustable parallax via a side wheel. Classic duplex, Mil-Dot or MOA stadia reticles are available for each model, and there's also a segmented­circle reticle for the 1-4x24. Trijicon also have a new civilian red dot sight. The Miniature Rifle Optic (MRO) boasts a large aperture and a tapered light path that maximize the viewing area, improving situational awareness and target-acquisition times. The 2 MOA dot is controlled by a handily-ambidextrous top­mounted brightness control, and by coin-adjustable windage and elevation adjusters that are safely recessed into a fully-sealed, waterproof, hard anodised forged 7075-T6 housing. Beechwood also distribute FLIR thermal-imaging devices.